If You Act Now It Could Make You 116x Wealthier! We’re entering Phase 2 of the legal marijuana revolution. The big story isn’t recreational pot. Investors stand to make over 20x more when Cannabis takes on the $1.1 trillion global pharmaceutical industry. With its powerful “Molecule of the Century” nanotechnology - this tiny Canadian biotech stock is poised to make medicines like CBD over 80x more effective. It’s the most important drug delivery breakthrough in history. And, the FDA is likely to fast track many of its upcoming therapies. If even one receives approval — this is a $10 billion stock. If all of them do? It will be a career-making investment. You’ll be introduced to their scientific dream team - with world recognized experts in heart, cancer, immunology, nanomedicine and drug delivery. Enough to turn $5,000 into an obnoxious $583,928 windfall. Your investment today will be just $1,999. Here’s everything you get when you lock in your 11,678% potential future gains with The Marijuana Manifesto. Trade alerts on up to 12 new picks each year.You’ll get automatic emails whenever we buy or sell a pick. Jimmy will detail what’s going on at the company that makes it a home run pick. These are plays you won’t find in Bloomberg or the paper. Jimmy’s interviewing many of the executives, visiting their companies even when they’re out of the country. “Quarterly Medical Marijuana Dispatch”. Inside each issue, you’ll get the full details on how cannabis is being used to cure some of the world’s most common and deadly diseases... the early-stage companies to watch... and most importantly, the firms that are about to rocket higher and take your money with them. White-Glove Treatment From Jimmy’s World-Class VIP Support Desk. If you have a question about your membership or any other concerns at all, my VIP team is ready to help. It can be about anything whatsoever. All you have to do is pick up the phone or send an email and we’ll take care of you. Plus Bonus Subscriber-Only Q&A Sessions, Transcripts of Conversations with Industry Insiders, Video Tours of Marijuana Facilities Worldwide, and Much More! If this firm locks down just 2% of the market, that could mean a $100-million-plus-per-year business. Or nearly three times its current market cap! "A Decade of Marijuana-Investing Experience in 30 Minutes: The Science of Picking Explosive Pot Stocks." 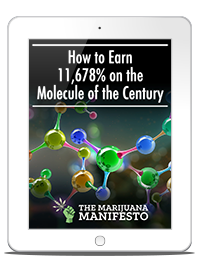 You’ll be taken under the hood of how I uncover the most profitable cannabis companies on the market today. 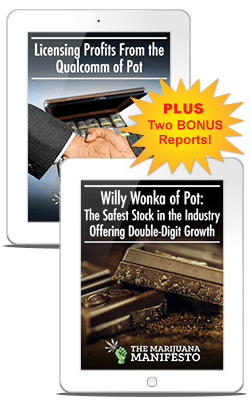 You’ll have everything you need to find your own lucrative pot stocks in just 30 minutes. "The Marijuana Industry Dissection." You’ll get an in-depth analysis of every corner of the pot market, beyond just the smokable flower. In just one short read you’ll know everything you need to start reaping riches from this exciting market. "The Pot Law Calendar." Each new state that rolls out legal marijuana provides a trigger for pot stocks to shoot higher. This calendar will keep you on top of the key dates around cannabis laws across the country. You’ll be able to access this calendar in your members’ area, where it’s updated monthly. Simply fill out the form below to receive your report package and get started immediately. 1,000% Gains In The Next 12 Months... Guaranteed! Here’s the deal: after 12 months with this service, you will see 1,000% total gains in our model portfolio or else you’ll get another year free. The last time we checked, Jimmy’s model portfolio had over 2,000% total gains. At that point you’ll easily pay for year 2 (and beyond) out of your stunning profits. No other promotion you’ve seen has this guarantee. Nor will it. In 2019 They will have several therapies in Phase 1 Clinical trials. This time next year they’ll be in Phase 2 with both heart and cancer therapies. Any one of those drugs could make them a multibillion dollar company. We’re looking at the next Bayer, Pfizer or Merck. But… with each passing day – more and more investors are hearing this story. Before you know it the stock will start spiking up… eliminating our opportunity. If you act in time - you could turn every $10,000 into $1.16 million! To guarantee your spot - simply fill out the secure form below now! You can dial (toll free) 1-844-539-7664 Monday-Friday, 8:30AM-5PM EST, to secure your membership with the Outsider Club's VIP Support Desk. If you accept this limited-time offer now, and aren't fully satisfied, you may use the available credit towards any other Outsider Club services. Simply call our customer service team. When you subscribe to The Marijuana Manifesto with your credit card, you will be billed that subscription choice rate. Every 12 months thereafter, we will automatically bill your card for $1,999, the lowest renewal rates we offer. With this auto-renew feature, you lock in the lowest available price and guarantee that you never miss an issue or a recommendation of The Marijuana Manifesto. This auto-renew feature does not obligate you in any way; you may opt out of auto-renew at any time after this purchase.